Passwords are broken. To improve their product, Mozilla Firefox needed to learn about everyday users’ daily struggles with creating, remembering, sharing, (and inevitably) resetting passwords. We worked with the Mozilla Firefox Security and Engineering teams to learn from users through ethnographic user interviews, and used our data to inform product design and product strategy - improving and innovating in building trustworthy and usable security. We asked users to map their own experiences, and draw their favorite passwords. In partnership with the Firefox Engineering Team, we used ethnographic interview techniques, journey mapping and participatory design, to develop a vision and strategy for usable and accessible login and password management. Drawing on Mozilla’s principles of the open web for all, the solution focused on trustworthy, integrated, and sociable experiences managing user data. Mapping patterns in password and login use. In collaboration with Mozilla’s Security and Engineering teams, we coordinated and facilitated a series of ethnographic interviews and a weeklong diary study in two North American cities. 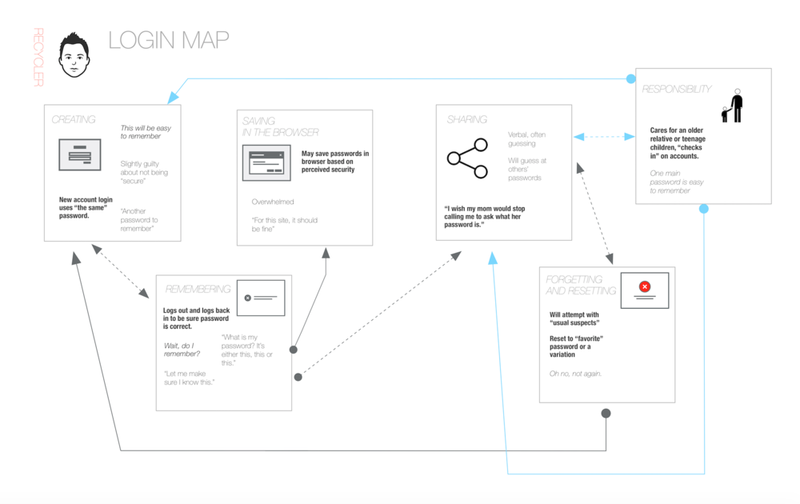 In analyzing and iterating on user insights and patterns in our data, we developed user journey maps, user flows, personas and design principles to address usability, experience, and accessibility barriers for future security and password management features. For each pattern, we mapped observed needs and behaviors.